A good night's sleep can prepare you for what is to come. Do you often wake up in the mornings feeling more tired than when you went to bed? Do you regularly wake up during the night for no apparent reason? Or do you have trouble getting off to sleep in the first place? Poor-quality sleep can quickly lead to reduced performance at work from reduced concentration, poor memory and diminished motivation, impaired judgment and irritability. Lack of sleep can also cause the body to crave high-calorie foods, potentially leading to weight gain. All of these side-effects can increase stress which, in turn can adversely affect your sleep and work. If you are one of the millions of people who occasionally suffer poor quality sleep, and you want to feel more rested, alert and ready to go, then the good news is that you can improve the quality of your sleep and so maximize your work performance. If you have more serious difficulties sleeping or are constantly tired, you may have a sleep disorder that requires medical attention. 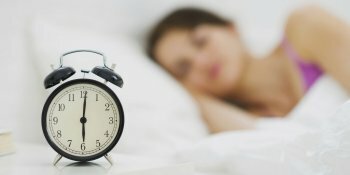 The web site www.sleepeducation.org does a great job explaining sleep disorders. If you are concerned about your sleep problems, you should, of course, consult a medical expert. What affects the quality of your sleep? Good quality sleep is an uninterrupted stretch of roughly 7-8 hours, during which your mind and body rest and recuperate, ready for whatever the next day brings. Some people need as little as 5 hours, and some as much as 10 hours, but the norm is 7-8 hours for most adults. The quality of your sleep is affected if it's interrupted. Two periods of four hours sleep, even quite close together, are not as beneficial as a solid 7-8-hour stretch. Getting uninterrupted sleep is obviously a challenge for parents of young children. However, others may have more control over their routine. So many factors can affect whether your sleep is interrupted – from external things like noise and light, to personal factors like snoring, or what (and when) you have eaten. The secret is to find out what factors affect your sleep and control the ones that you can. We have some resources and tips to help you do that later in the article. Just as interruptions to sleep affect its quality, so do irregular sleeping patterns: Changing your bedtime or waking time can play havoc with your body clock. Shift workers are the extreme example; they have to change their sleeping pattern frequently to fit with their shifts, and so they have to work harder to get good-quality sleep. It is difficult to find the same levels of darkness and quietness during the day, and as our natural "circadian" rhythm responds to natural daylight and darkness, shift workers have to contend with this issue every time they change shifts. For more help on shift work-related sleep problems, the Sleep Foundation has information and advice on how to cope. Regular day time workers may find that they are also affected by changes in sleep patterns at the weekends. The body takes a few days to adjust to a new pattern of sleeping and waking. So people who like to sleep till noon at the weekend but then party the night away may find that their bodies have just about worked out how to do this by Monday morning, and so they find it a real struggle to get to work on time! Jet lag is another well-recognized affect of changing sleep patterns, which occurs when you travel across several time zones. When traveling across time zones, your body clock gets confused by the levels of light and darkness at different times of days. Did you know that jet lag hits harder when traveling west to east rather then vice versa? So a traveler from North America to Europe will usually suffer greater effects of jet lag on the outward (east bound) journey than on the return home. This is because our bodies cope better with extending the day, than with reducing it. A traveler from New York to London, for example, is more likely to suffer jet lag when he reduces his day by 5 hours on the outbound journey, than when he extends his day by 5 hours on the way home. For more information on jet lag, British Airways has a neat little Jet Lag Advisor to help you work out when to avoid daylight, and when to seek it.